Should I do the Nazca Lines Flight? Home Countries Peru YQA: Should I do the Nazca Lines Flight? 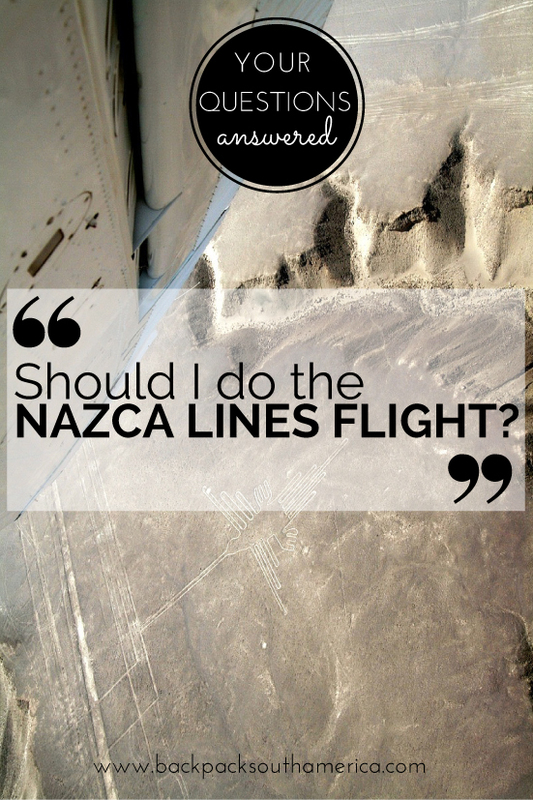 YQA: Should I do the Nazca Lines Flight? Your Questions Answered is a new feature on Backpack South America which aims to answer specific questions from fellow travellers, with as much detail as possible. Read more about this feature here and get in touch if you have your own question – we have a team of South America experts who are dying to help! I was planning on doing the Nazca flight with my boyfriend, but we read that the flight experience wasn’t that good. Would you recommend to take those planes? I live in Peru, and I’m currently in a long distance relationship. So, every time my boyfriend visits we usually travel somewhere outside the capital. We have been to Ica twice, and last time we considered doing the Nazca lines but didn’t have much information about it. The Nazca lines are a pretty iconic sight in Peru – in fact the tail of the famous monkey line has been adapted into the country’s newly re-branded tourism logo, while the popular hummingbird appears on t-shirts and other souvenirs all over Peru. Discovered in the 1920s, these huge geoglyphs in the Nazca Desert (400km south of Lima) were created by the Nazca culture between 400 and 650 AD and were made by removing the top layer of red pebbles to reveal the grey ground beneath. Not much is known about the lines and how or why they were made, but they are certainly archaeologically significant, and fascinating. How Much Does a Flight Over the Nazca Lines Cost? I paid $110 USD for a tour package including return transport from Huacachina, plus the additional airport tax, while day tours from Lima start at around $350 USD. So it clearly works out a bit cheaper to take the public bus to Nazca, head straight for the airport, and pay the airline directly for a flight. On a quiet day, you may even be able to negotiate the price down. FYI – I also flew with Aero Paracas and would definitely recommend them! What is the Nazca Flight Experience Like? You might have to wait around a lot. Assuming you haven’t booked ahead, when you arrive at the airport you’ll be confronted with a choice of several airlines. From what I remember there were about eight to ten companies; it certainly wasn’t many. After you’ve selected your airline and paid for the ticket, you may find yourself waiting around for the flight – and there is very little to do at the airport, so take something to read! The planes are very noisy. After take off, the noise of the engine is pretty bad inside the plane. You’ll be given noise-cancelling headphones to protect your ears, which also allow the pilots to speak to you and let you know the names of the lines as you fly over. Air sickness is a very real possibility. Just like I did, many (perhaps most) passengers experience severe airsickness, so even if you don’t normally suffer from motion sickness it’s worth taking preventative measures or medication before the flight if possible. You probably won’t get very good photos. The planes fly higher than I’d realised, so the lines look smaller than in most pictures I’ve seen. In fact, my boyfriend described them as “underwhelming”. Although they’re up to 200m across, from that high and through the very shaky plane windows, the lines can be hard to see. I found it impossible to get any good photos, and instead put the camera away. Would You Recommend the Nazca Flight? Well…yes and no (sorry for the inconclusive answer). If you’re interested in archaeology, the Nazca lines, or ancient South American cultures, if you’re an adrenaline junkie, or if you fancy trying your hand at a flight in a small plane, it’s probably worth swallowing your fear, grabbing your sick bag and hopping aboard a flight over the Nazca lines. BUT, if you’re afraid of flying or heights, don’t like cramped and small spaces, or you’re generally easily scared, I would suggest avoiding the flight altogether. Equally, if you’re not hugely interested in the Nazca lines other than thinking “it might be cool” to see them, I would say that it’s probably not worth the cost or the discomfort. Is a Nazca Lines Flight safe? How Else Can I See the Nazca Lines? Many people say that there is no point visiting Nazca unless you’re going to fly over the lines. However, there is a Mirador (lookout tower) in the middle of the desert along the Carretera Panamericana, 20km northwest of Nazca. The tower is a spindly metal staircase which gets you about two or three storeys high, and offers a decent view of two figures – the hands and the tree. It’s nowhere near as good a view as flying over the lines, but given the bumpy flights your photos may actually be better. However, I can’t say that it would be worth the long trip all the way to Nazca just to climb the tower – although it is worthwhile if you’re stopping overnight to break up a journey between Cusco and Lima. Go to the main bus station and take any bus heading north. The charge is S/3 (about $1 USD), and you will need a passport to purchase a ticket. Walk west from the bus station towards the roundabout and hop on any of the buses waiting there. You will not need a passport, and the charge is S/2 ($0.65 USD). To get back, you will need to hail a bus travelling in the opposite direction – which may involve a slight wait at the mirador. Alternatively, you can take take a taxi and have it wait for you at the mirador to return, but this will work out more expensive (around S./ 50 or $16 USD according to WikiTravel). The journey from town is about 25 minutes. Entrance for adults to the mirador costs S/2 (£0.50) or S/1 (£0.25) for children, students and retirees. You can also walk from the mirador to a nearby hill for a view of the desert, but this takes about 20 minutes and as this is the desert, the heat can be quite intense. Take plenty of water! Finally – it is possible to view some of the lines from mountains and hills surrounding Nazca. Again, the desert heat can cause many problems, so this is only recommended for experienced hikers. Be careful not to walk on or near the lines, as this is illegal and causes terrible damage. Have you visited the Nazca Lines or taken a flight over them? What was your experience?If you have any helpful advice for Claudia and other travellers in Peru, please leave a comment!